Grown up, that is how I felt two years ago when I started studying here in Maastricht. I was going to become independent, make new friends, party all night long and, of course do a bit of studying at the department for Translation and Interpreting at Zuyd University. For me this new adventure was somehow even more special because I’m in a wheelchair and have had a very protected upbringing. What I underestimated was the time that it actually took me to adapt to this feeling of independence. In my new house I had to learn to wait for help and live together with ten other people who had a different frame of reference in the sense that they don’t follow higher education. I also experienced that it is not as easy as I thought to make new friends. This made me realise how attached I was to my secondary school friends I had left back home in the Gelderland region. 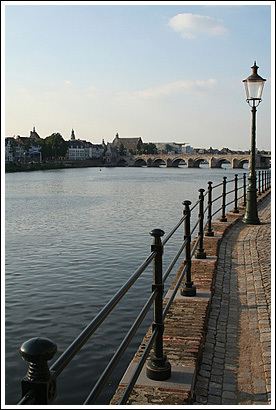 The first few months in Maastricht were an awful period during which I felt very lonely and insecure, as if I were a total stranger in my own country. I found myself staying indoors quite frequently watching television or playing on German online casino games to pass the time. Limburg to me seemed very different from the rest of the country and even though I’m Dutch, it took me some time to start feeling at home here. A specific aspect of living in Maastricht or Limburg is the language and culture barrier I have experienced. However unbelievable it may sound, this is possible even in such a small country as the Netherlands. Near Arnhem, where I grew up, we speak Standard Dutch, without any specific accent or dialect. But here in Limburg people speak their very own ‘language’, called Limburgish (“Limburgs” in Dutch). Since it is used on a wider scale than than an average dialect it has the status of regional language. Even after living here for several months, the dialect of Limburg can still be quite incomprehensible for a newcomer. Things even get more complicated, because almost every town or village has its own form of dialect! There are many more examples I can come up with, but these are some of the most commonly used words. People who speak German probably notice the big resemblance between Limburgish and German. Pronunciation varies from town to town, and Limburgers can guess where a person comes from just by their accent, isn’t it amazing? Limburgers not only speak a different language, they also act differently. They tend to speak Limburgish to each other, without realising that some people in the room may not understand it. When asked, they will switch to Dutch, and apologise for speaking Limburgish but deep in their heart they seem to think that you should learn their dialect. You are the one who wanted to live here, so you should learn the language, something I still refuse because I feel it is fake for non-native Limburgers to speak dialect. This made me feel isolated in the beginning, because I didn’t understand a word of what people were saying. After a few months however, I did get better at it.